This is super simple and gives garlic a mild almost sweet richness that adds so much to anything you put it in. You can do it in the oven or on the grill. Today I was smoking some ribs, so that's where my garlic ended up. Just leave it on longer if you smoke it. 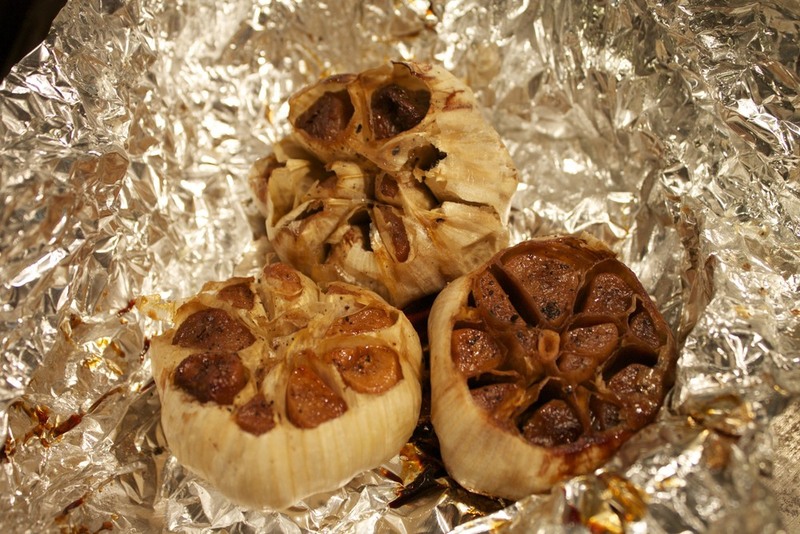 Start by cutting off the top of the head of garlic so that you can see the individual bulbs. Place it on a piece of foil and drizzle it with the olive oil and salt and pepper. Close the foil and bake at 400 degrees for 30-45 minutes until the garlic is soft and golden in color. When the garlic is done, just hold it from the bottom and squeeze and the cloves will come out. Tonight I added it to our mashed potatoes, but you can use it in so many different ways. Try it spread on bread, mixed with sour cream for a dip, or used in any sauce that calls for garlic. It is very mild and rich and delicious! Posted in In The Kitchen and tagged with garlic, roasted. August 15, 2013 by Lynn Adams.